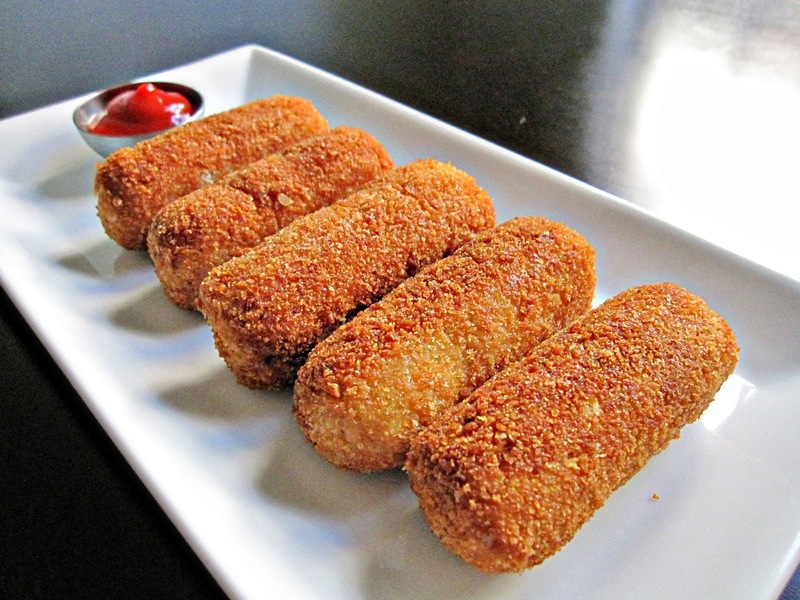 Croquetas originated from Spain and are often served as part of a tapas menu. Although I never knew that, I always just assumed they were Cuban. Partially because they're available at every Cuban bakery in Miami. They're the quintessential snack food that seemed to always be present at parties, get-togethers, and Sunday breakfasts. My brother inspired this post. He said it best with his twitter update of a few weeks ago. "Nothing cures a hang-over like a croqueta preparada". What is a croqueta preparada you say? It's a sandwich made with Cuban bread (much like French bread, only not as crusty, more on the soft side) two croquetas, (ham and cheese- but I skip this part) and ketchup. Some add onions or even lime juice. Wash that baby down with a Jupiña and you'll be good to go till dinner time. The most common variety of croquetas are the ones made of ham (I used turkey ham for these since I follow Kosher laws), but really any ground up protein will work. When I was little, my family used to make croquetas out of the leftover turkey at thanksgiving. The croqueta made of chicken are probably the next most common version. I've seen them made of cod, spinach, all sorts of things- really the sky's the limit. So go on... make one. You'll be glad you did. First thing to do is add the butter to a non-stick pan. Let it melt and then add the flour. With a silicone whisk or spatula, begin combining the flour and butter. Let it cook a little bit on medium heat so that the raw flour taste cooks out. Finely dice your onion and toss it into the pan to cook with the flour and butter mixture. Next add the milk and chicken stock and begin whisking vigorously to incorporate the flour well into the milk. Add the wine at this point. Make sure to dissolve any clumps- and turn the heat down to medium low. Add the ground nutmeg and salt and combine well. The sauce will thicken considerably. But that's the way it's supposed to be for this particular dish. Turn the heat off at this point. Chop up the ham into cubes and toss into the food processor. Run the processor for about 30 seconds. Now add the ham to the bechamel sauce, making sure to incorporate well.Make sure you let this mixture cool completely before moving on to the breading. I transferred this mixture to a pan and put it in the fridge for about 30 minutes. Once you can touch the mixture without burning yourself, begin forming the croquetas and then passing them through the egg and bread crumb mix. You'll want to repeat the process twice for each croqueta. Transfer to a plate and let them just hang out there. Put the canola oil into a non-stick pan and turn the heat up to medium. Once the oil is hot, transfer the croquetas to the pan. Making sure to turn them on every side to make sure you get a nice even golden color throughout. Serve with some ketchup. If you've had a long night and want a "stick to your ribs" meal, slap two croquetas in between some Cuban or French bread, squeeze some ketchup and enjoy the "croqueta preparada". hola,vivo en madrid(españa),aqui es tipico el cocido madileño y con las sobras de carne se hacen las croquetas. la forma de cocinarlas es parecida ,se pone aceite de oliva para reogar la harina ,y la masa queda mas blanquita.son tipicas en toda España ,se toman como entrante o segundo plato,a los niños les encantan.saludos,bonito blog. Hola Mari! Me alegro que te haya gustado el blog. Nunca he ido a Madrid. Solo a San Sebastian y Barcelona. Me encanto. Ojala pueda volver pronto. Las croquetas que mas me ha gustado ha sido la de pavo... Gracias por el comentario. Saludos! Love your website with recipes and pics. You're a talented, true YUCA and that's nice to see. I look forward to seeing more! Where I live we do not have croquetas available, so I decided to make my own. When I tried to make croquetas de jamon before, they came out tasty but with a not-so-good flourly pasty consistency. I tried your recipe, and my goodness, ate them and closed my eyes, and there I was as a child agian with my mother and grandmother!! DELICIOUS, AND WHAT NICE MEMORIES!! !